GOLD KEYS and the opportunity to apply for college journalism scholarships were awarded to 321 writers, photographers and designers in the 2018 Quill and Scroll Writing, Photography and Multimedia Contest. Of the 2,065 entries received by Quill and Scroll, judges recognized 259 across 23 categories as winners. Students were recognized as Sweepstakes Winners (first place), Second Place, Third Place and Honorable Mention. Sweepstakes winners (except in the In-Depth Team category where each student will receive a special certificate) receive a plaque. All individual winners receive a Gold Key. Gold Key winners are eligible as seniors to apply for one of the Edward J. Nell or George and Ophelia Gallup Memorial journalism scholarships. Read about them and apply here. If you would like a slideshow of the winners, with links to all the writing entries as well as full visual representation of the visual entries, please email Executive Director Jeff Browne. 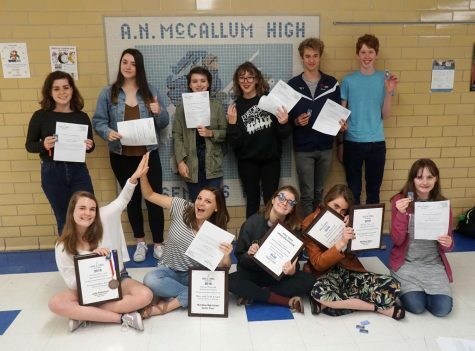 McCallum High School (Austin, Texas) students celebrate their Gold Keys. Following are the number of winning entries and the total number of entries in each category.